While losing some of your hair on a daily basis is no cause for concern, excessive hair loss may be enough to send some shivers through your spine. So, how do you know when the amount of hair you are shedding is well within the normal range and how do you know when it’s time to see your doctor about it? Here are some things you definitely need to know. On the average, most people lose anywhere between 50 to 100 strands of hair on a daily basis. So, when you see some of your hair on your hairbrush or on your bathroom drain, don’t fret about it. These are probably the strands of hair that are undergoing the normal resting phase and are just about to fall out after all. Soon enough, there will be new ones to replace the ones you’ve lost. However, if you start losing more hair than usual or if your hair starts falling out in clumps leaving bald patches all over your head, it may be time for you to consult your doctor about it. For all you know, there may be an underlying condition that is causing your hair to fall off unnaturally. Unnatural Hair Loss – What May Be Causing It? Stress. People who underwent severe physical or emotional trauma such as sudden and excessive weight loss, serious infection, surgery or the loss of a loved one can be enough to trigger hair loss. Hormonal factors. Hormonal changes due to pregnancy, childbirth, use of birth control pills or menopause may bring about hair loss. Underlying medical condition. Certain medical conditions such as anemia, thyroid problems, diabetes, lupus, scalp infections and other skin infections may cause temporary and permanent hair loss. Medications. Drugs used to treat arthritis, cancer, depression, heart problems and hypertension may also trigger the problem. 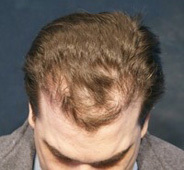 It may also be possible that you are genetically predisposed to male or female pattern baldness or alopecia areata. In any case, the best thing for you to do is to consult a certified hair restoration expert such as Dr. Mark DiStefano of the DiStefano Hair Restoration Clinic about your problem to get the best professional advice possible.